Then see the movie, Fireproof, starring Kirk Cameron. I saw it this weekend and loved it. Go see it soon before it is out of the theaters. 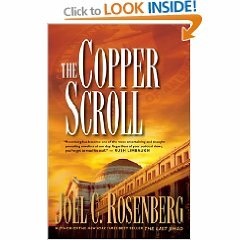 …then you’ll enjoy reading The Copper Scroll by Joel Rosenberg. Also read his non-fiction book, Epicenter. Have you been distressed about the economy, the stock market, auction rate certificates, banks going belly up, etc? My riches may not get me far. but I’ve got something in my heart that can’t be taken away. This love that Jesus gave to me is far more precious than gold. Greater than all the wealth this world can hold. What does the Word say about riches? I hate repeating myself, but I must in this case. I’ve said before that I love quirky characters and they usually happen to be detectives of some sort. A widower professor with musical halluciantions becomes a sleuth to solve a fellow instructor’s murder. Unfortunately for Preston Barclay, he is one of the suspects and he must solve the crime to prove his own innocence. Musical hallucinations. Sometimes they fit the situation like the musical scores to movies, but sometimes they didn’t which made for many funny moments. The book is full of humorous quips. Okay, so I think this author is brilliant. Go buy the book, Rhapsody in Red, by Donn Taylor to see how the author was able to pull off the musical hallicinations by using words. I know no movement more filled with passionate longing, and Faith’s smile came again as the music’s emotion deepened. At long last the violins returned with the fullest, most intense development of the theme. And at that moment of singing violins Faith’s spirit slipped away from her body, which yet lay with a smile on its face, its lifeless hand in mine. I think it was also that moment when the music passed from Faith’s soul into mine, where it still resides. Toby Mac – At the North Carolina State Fair Oct 18th! I can’t wait to see Toby at the NC State Fair. Here’s a video. By the way, this song was featured in the movie, Game Plan, starring The Rock. That is a wonderful movie. Click HERE for more videos by Toby Mac. I’ve been surprised many times by the relevancy of scripture to whatever is happening in my life. I thought, Wow, God sent me a birthday card. How amazing. Today, I’m watching the weather reports because there is a hurricane heading my way. In fact, there may be two hurricanes heading my way. I remember Hurricane Fran which caused quite a bit of damage in my area in 1996. My power was off for 3 days. Others weren’t so lucky. They were without power for more than a week. 1-3 God is a safe place to hide, ready to help when we need him. Thank you, my Lord, my God, my Savior, Jesus, for your protection. This is the satellite image of Fran from Sept. 5, 1996. It is hard to believe it was 12 years ago. Hanna, which is a tropical storm at this writing doesn’t appear to be as menacing. I would have slept through Fran had a tree not fallen on the house. I heard the thump, woke up and thought my son who was 2 at the time must have fallen out of bed.